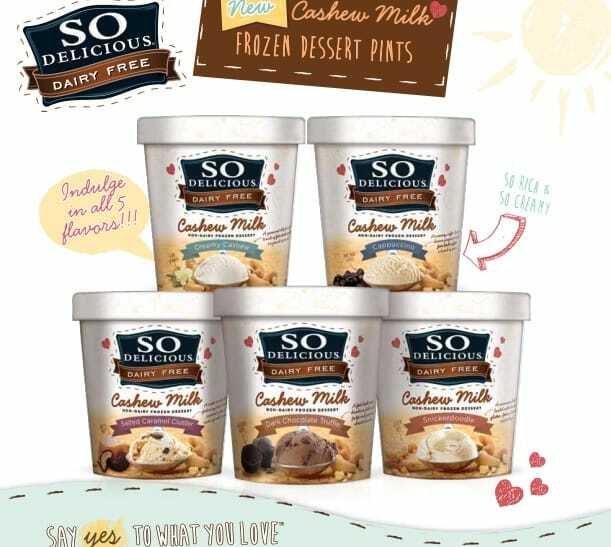 Recently the folks at So Delicious sent me five pints of their brand new So Delicious Cashew Milk Non-Dairy Frozen Dessert aka “Ice Cream” to try out. Technically, to be called ice cream a product must contain a certain percentage of dairy milk fat. For the purpose of this review, I’m calling it ice cream because it sure tastes like ice cream to me! The pints of ice cream arrived in a Styrofoam cooler packed in dry ice. 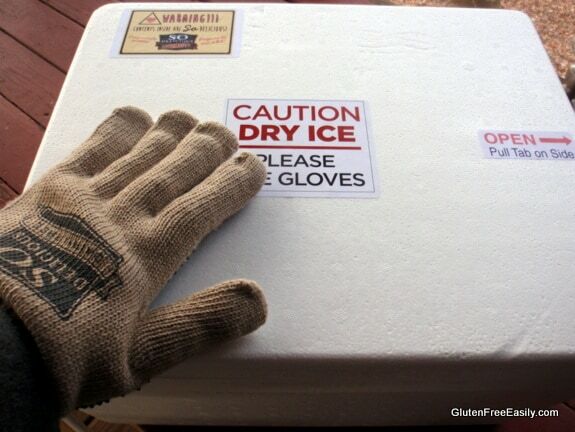 The packaging came with special gloves for one to remove the ice cream so that one could not be possibly injured by the dry ice (which will cause burns due to the extreme cold). The packaging was kind of impressive but the ice cream contents were, of course, the most exciting! As much as I enjoy eating dairy, dairy is not really my best friend and ice cream is a weakness of mine. So I was understandably excited about this new ice cream that my good friend Alisa (Go Dairy Free) had already given a rave review. Let’s face it … not all dairy-free products are created equal. If there’s anyone I trust for an accurate assessment when it comes to dairy-free/non-dairy goodness, it’s Alisa! 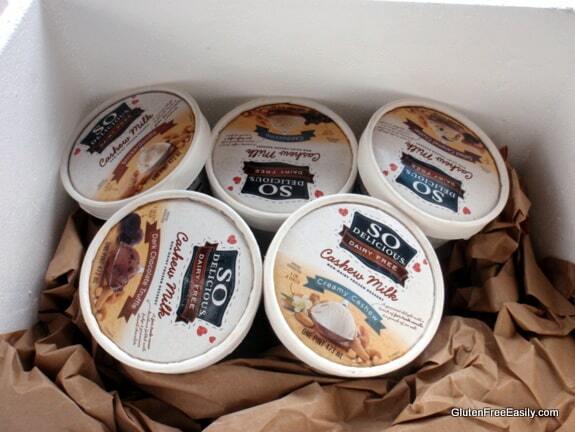 Five Pints of So Delicious Cashew Milk Ice Cream … A Vision! If you’ve ever used cashews to make your own cashew milk or cashew cream, or in dairy-free baked goods like cheesecake, you know that cashews offer an amazingly creamy texture and they just blend into the water (or other liquid) and “become one.” There really is no separation factor as with other nut milks. 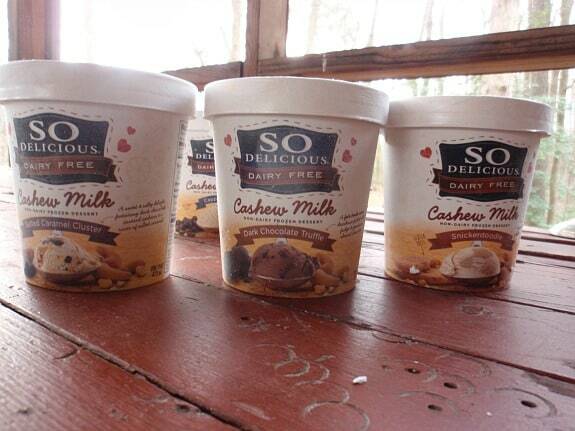 The So Delicious Cashew Milk Dairy-Free Ice Cream comes in five flavors. I asked my gfe Facebook readers which flavor they would try first. Everyone was very excited about this ice cream so their answers were fast and furious. Most readers simply stated their single top choice and their answers varied—although Salted Caramel Cluster was tops on the list—but some readers simply couldn’t pick one. That’s quite an achievement for ready-made ice cream. You can see more specifics in the ingredients listing for all the products below. Now being free of all those things, you might think this ice cream would not taste anything like ice cream, but you’d be wrong. So wrong. 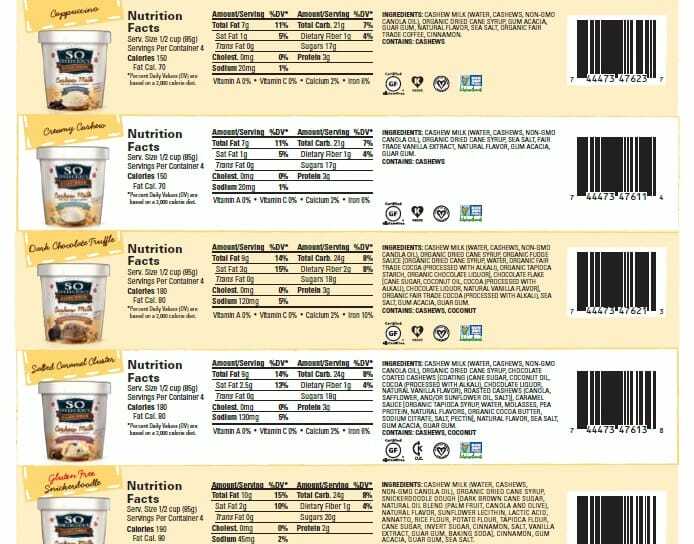 As I said cashews offer such an amazingly creamy base and So Delicious has added ingredients like fair trade cocoa, fair trade coffee, and organic tapioca starch. Is there sugar in this ice cream? How much? Yes, as you can see above, there’s sugar in the form of organic dried cane syrup in most of these flavors and cane sugar in addition in one of the flavors. The amounts of sugar are about on par with what any ice cream would include. (Check out the listing above for more details.) These are a much healthier treat than most ready-made ice creams but, of course, they are still just that … a treat. Salted Caramel Cluster ~ This flavor was the very first one I tried and ending up being my overall favorite. I’ve always loved the Salted Caramel combination and this flavor provided that nicely. But the piece de resistance for me was the “clusters” of chocolate-covered cashews (whole and in pieces) scattered throughout. Rich creamy cashew ice cream with swirls of caramel and those divine clusters. Creamy Cashew ~ This flavor tied for second place in my ranking. This two-word title describes this flavor perfectly. The creaminess is off the charts and the rich cashew flavor is prominent and very satisfying. Alisa said that this ice cream reminded her of pure butter pecan ice cream(that creamy base) and that’s really a great description. You could take a single pint of this ice cream and have enough small, satiating dollops to make several folks happy. Dark Chocolate Truffle ~ I loved this flavor for its rich chocolate flavor and the bits of chocolate throughout. It did seem a wee bit less creamy than the other flavors to me, personally, but that didn’t slow me down on enjoying this flavor. If I needed a chocolate ice cream fix, I’d happily add it to my shopping cart. If you’d like more opinions on this new So Delicious Cashew Milk Ice Cream, be sure to read this review from another good friend of mine, Lexie at Lexie’s Kitchen. Lexie not only shares her opinion, she got her hubby, two boys, brother, and friend to taste test with her! So Delicious was generous enough to send me nine FREE coupons for their products. I headed to our local upscale grocery store, Wegmans, to pick up some more for gluten-free, dairy-free Son to enjoy while he was visiting for Easter. How sad was I to see that our local Wegmans did not yet have the cashew milk ice cream on their freezer shelves! 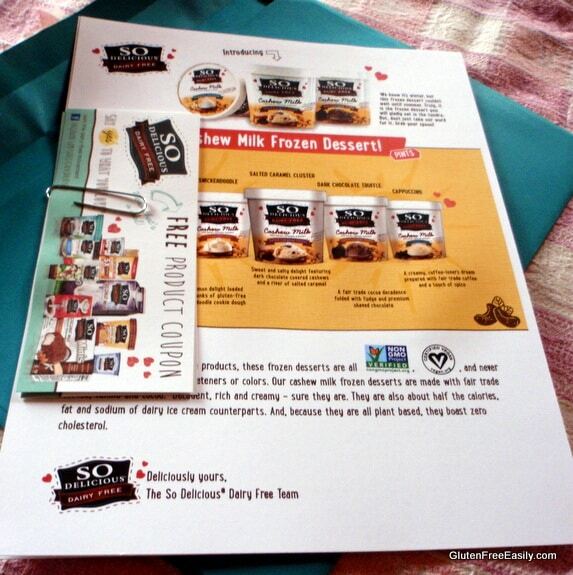 Free Coupons for So Delicious Dairy-Free Cashew Ice Cream! UPDATE: This giveaway is now closed. The winners are shown below. Each will have 24 hours to respond to my notification. If there is no response, a new winner will be selected. But my loss is your gain as I’m giving away these coupons to you all. THREE readers will win three FREE So Delicious coupons so that you can sample this new ice cream. (Maybe you’ll even come back and tell us your favorites.) Note that the coupons can be used on any So Delicious products (maximum redemption value is $11 per coupon). An even more important note is that most of these coupons expire on April 30. That’s why this giveaway has a very quick turnaround. The giveaway ends Monday, April 13, at midnight Eastern. Winners will have 24 hours to respond to my winner notification email or new winners will be selected. I want to mail out these coupons as soon as possible! To enter the giveaway, simply leave a comment below telling me which flavors are at the top of your list to try. p.s. If you don’t enter giveaways, note that So Delicious also offers coupons to fans if they sign up for their newsletter. They’re not FREE coupons like the ones in this giveaway, but every little bit helps when it comes to the grocery bill, right? Full Disclosure: So Delicious Dairy-Free provided me with these samples and coupons at no charge. I was not otherwise compensated for sharing this review and the opinions expressed here are, as always, strictly mine. This post is linked to Gluten-Free Wednesdays, Allergy-Free Wednesdays, and Gluten-Free Fridays. You’re welcome, dear! I always love you and your crew’s enthusiasm when you win giveaways. You make my day! I love their ice cream! Salted caramel and creamy cashew would hit the spot ! I love the sound of all these flavors! Seriously, I’m glad I didn’t get sent 5 tubs because that’d be dangerous lol. But they all sound dreamy! I’d start with Dark Chocolate Truffle then move on to Salted Caramel Cluster. cappuccino sounds so good to me. I would start with the Dark Chocolate Truffle before moving on to the Salted Caramel. yumm! I really love Anything with Dark Chocolate Truffle in the name, and although I haven’t yet tried any of the Cashew ice cream flavors, I love their Coconut Milk ice cream. I’m voting for Chocolate because it’s not a flavor, it’s a FOOD GROUP!!! The salted caramel is the best ever! The gluten free snickerdoodle sounds delicious! Being both GF and dairy free, it is hard to find cookie flavored ice creams I can eat! Wow! Does this look amazing! The Cappuccino and Dark Chocolate Truffle are at the top of my list! They all sound delicious. I would like to try the cappuccino, the creamy cashew, and the snickerdoodle. Wow Shirley! I’m inclined to want to try the Salted Caramel and the Dark Chocolate Truffle. Thanks for the chance to win! All of the flavors sound delicious but the Dark Chocolate Truffle sounds divine. I would like to try the salted caramel, creamy cashew, & maybe the cappuccino. Thanks! I’d say dark chocolate is the winner for me. Of course I am the biggest chocolate lover of all time so this would be an easy choice. My second choice would be the Salted Caramel… Thanks! I can’t wait to try the Salted Caramel Cluster flavor! So excited that this is gluten free and soy free. Sounds so delicious-YUM! Salted caramel and dark chocolate truffle are at the top of my list. Thanks for saying Wegmans has it because that was my next question. I love my Weggys and I am there every week, so I will definitely be on the lookout for this. I am beyond excited. I love cashew milk and I use it for everything. It is nice to have the choice. When my kids were small all we could get was soy milk, and it wasn’t until the last few years that the nut milks came out. Cashew milk is the easiest to make and cook with, but there isn’t much difference in price between making it and buying it, so I buy it! Salted Caramel Cluster! Definitely. Or Cappuccino. Both, yes, both! The Salted Caramel Cluster sounds amazing. Thanks for the giveaway, Shirley! Would love to try creamy cashew abd snickerdoodle. My top 3 tries would be salted caramel, cashew, and snickerdoodle. Thanks for the review. Can’t wait till my store carries them. Definitely the Dark Chocolate Truffle!!! Definitely dark chocolate truffle. LOVE dark chocolate. So excited about these! I’ve checked at Wegmans a few times and they’re not here yet, but I REALLY want to give these a go! I just discovered So Delicious products in the last month. Love the Snickerdoodle and Dark Chocolate Truffle. I would like to try the Creamy Cashew. I hope I’m a winner! MY CHOICE WOULD BE THE SALTED CARMEL CLUSTERS AND SNICKERDOOLE. GREAT CHOICES!!!!! HOPE I WIN. Snickerdoodle actually sounds the best to me! Have to say that they all sound amazing, guess would start with the Salted Carmel. I think I would mix the salted caramel with the double chocolate, that way you get chocolate and salt together. MMMM My favorite combo! Salted caramel first, creamy cashew second, chocolate truffle third, snicker doodle fourth, and cappuccino last. I’d probably love the cappuccino but I react to coffee.. Still, I may need to hold a ‘tasting’ for myself and friends who are on restricted diets. What a fun gathering that would be.. I would and am going to try the cappuccino and the chocolate. Thanks for the review on them now I will try it. Salted Caramel and Snickerdoodle were the first two to catch my eye. In my book, you can never go wrong if cinnamon or caramel is involved! Yum, yum! Salted caramel and snickerdoodle for me (I mean, my whole family, lol)! The salted caramel is making me drool! Chocolate truffle sounds awesome too!! Salted Caramel or Dark Chocolate Truffle would be the ones I would try first! The Dark Chocolate Truffle has my attention. Would be curious to try. Thank you. Thanks for the review Shirley. I will have to look for So Delicious Cashew Milk products in Canada. I want to try the salted caramel cluster and the creamy cashew. And the dark chocolate truffle. Mmmmmm, they all sound so good! Yum! I’d like to try them all, but if I can only say one it is Cappucino! I’ve made my own “ice cream” with cashew, and I loooooove it! A hassle to make your own, and I’m sure So Delicious is better than my concoctions!! Trying to watch my sugar intake so the chocolate or cappuccino please! Salted Caramel Cluster and Snickerdoodle would be tops on my list. Dark chocolate truffle and salted caramel cluster sound fabulous! I would love to try the Salted Caramel Clusters! Salted Caramel Cluster and Cappuccino would really hit the spot. Yum Yum! All the flavors sound super tasty but I would want to dig into a combo of Salted Caramel Cluster and Creamy Cashew. I bet that would make one amazingly delicious snack! the salted caramel cluster is #1 on my list to try. Sounds SO good, and has chocolate too! It is a toss up for me between the cappuccino and the salted carmel. Maybe a little scoop of each would make for the perfect bowl! Salted caramel cluster, but whenever I can find them I want to get all 5 to try! Might have to put in a special order. I would try the Salted Caramel Cluster and Creamy Cashew first. Those two sound the yummiest. I think I would love the cinnamon in Snickerdoodle, I had a cinnamon Ice cream once many years ago at a small town ice cream parlor and no one ever sells that. I would love to try that. Dark chocolate truffle. They all sound delicious. Can’t wait to try them!!! Salted caramel or Dark Chocolate Truffle both sound like they would quickly become my favorites. Cappuccino… hands down. That would be first… and Salted Caramel… hands down that would also be first!! oh gosh I want some Creamy Cashew! I would love to try Snickerdoodle and Creamy Cashew. Sounds delicious! I’d love to try the creamy cashew! Salted caramel cluster and the dark chocolate truffle Sound awesome! I’d try dark chocolate truffle first. I will definitely try Salted Caramel Cluster first (I love caramel) and then Dark Chocolate Truffle. Yum, yum!! I love the vanilla!!! I haven’t tried a lot of them!! Thanks for the chance! Salted Caramel Cluster would be my first choice. What interesting and unexpected flavors! I don’t think I’ve seen these yet in stores. Must investigate. So excited I won! I cannot wait to try my planned mix for a snack soon!! Thank you!! I am missing ice cream so much! I can’t wait to try one of these!